The Zapier integration allows you to seamlessly connect I Done This to over 500 applications within the Zapier marketplace. If you can't find something I Done This directly integrates to, you'll most likely find it within Zapier. 1. Simply log into your I Done This account and ensure that you're logged into Zapier as well. You can log into your I Done This account here. 2. Navigate to the bottom left of the screen and select Integrations. 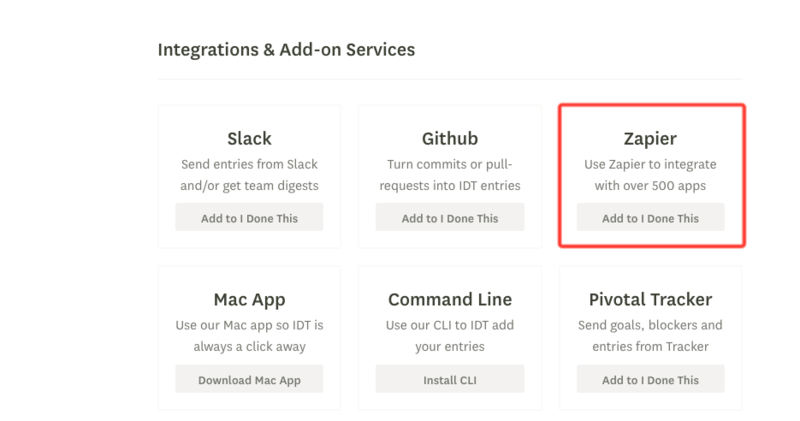 On that page, select the button under Zapier integration, "Add to I Done This"
3. Once connected, you can find the app when you create a zap with other apps. To read more about creating zaps, click here. If you have any additional questions, please contact us at help@idonethis.com.